See vivid imagery from almost any angle. 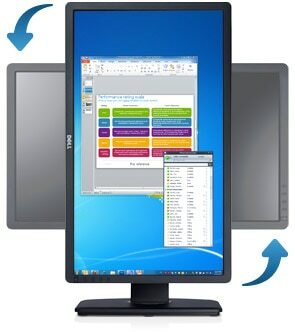 The 23” DellTM UltraSharp U2312HM monitor with LED offers a brilliant view, rich colors and adjustable height options. Lose yourself in the details: : Enjoy 1920x1080 (max) HD resolution, a vivid 2,000,000:1 (typical) dynamic contrast ratio and IPS technology for outstanding color consistency across a wide viewing range. Your monitor is your window to inspiration. Enhance your vision with the DellTM UltraSharp U2312HM with impressive features that can take your imagination to the next level. The DellTM UltraSharp U2312HM provides a remarkable viewing experience that can help inspire whatever you’re working on. Amazing clarity: : Enjoy crystal-clear, true-to-life images with full 1920x1080 (max) resolution. Plus, get accurate, consistent colors regardless of your viewing angle with IPS technology. Heightened contrast: Get razor-sharp, moving images free of motion blur with a 2,000,000:1 (typical) high dynamic contrast ratio and 8ms with overdrive (typical) gray-to-gray response time. Vibrant colors: : Experience an impressive 16.7 million colors displayed in rich, dramatic and accurate style with a wide color gamut at 82% (typical). Your productivity demands comfortable and efficient use of your monitor. The DellTM UtraSharp U2312HM monitor offers a wide range of customizable features to optimize your viewing experience and your comfort. Maximize your viewing experience by adjusting the U2312HM to your desired height with its improved height adjustment range of 130mm (5.12 inches). Meet the latest environmental standards: The U2312HM meets EPEAT Gold and TCO Certified Displays standards, is ENERGY STAR® qualified and CECP compliant. Manage power usage: PowerNap software*, when enabled, lets you dim the monitor or put in sleep mode when not in use. Dynamic dimming* automatically adjusts the brightness when images are extremely bright. You can even monitor your energy usage with a quick glance at the onscreen display. Make a responsible choice: The U2312HM is easy to recycle and made from environmentally responsible materials, such as an arsenic-free and mercury-free LED panel. It also has halogen-free laminates in its circuit boards. Get reliable service and warranty coverage. The U2312HM monitor comes with 3 years of Advanced Exchange Service*, a Limited Hardware Warranty and Premium Panel Guarantee.